When it floods in California, the culprit is usually what’s known as an atmospheric river—a narrow ribbon of ultra-moist air moving in from over the Pacific Ocean. 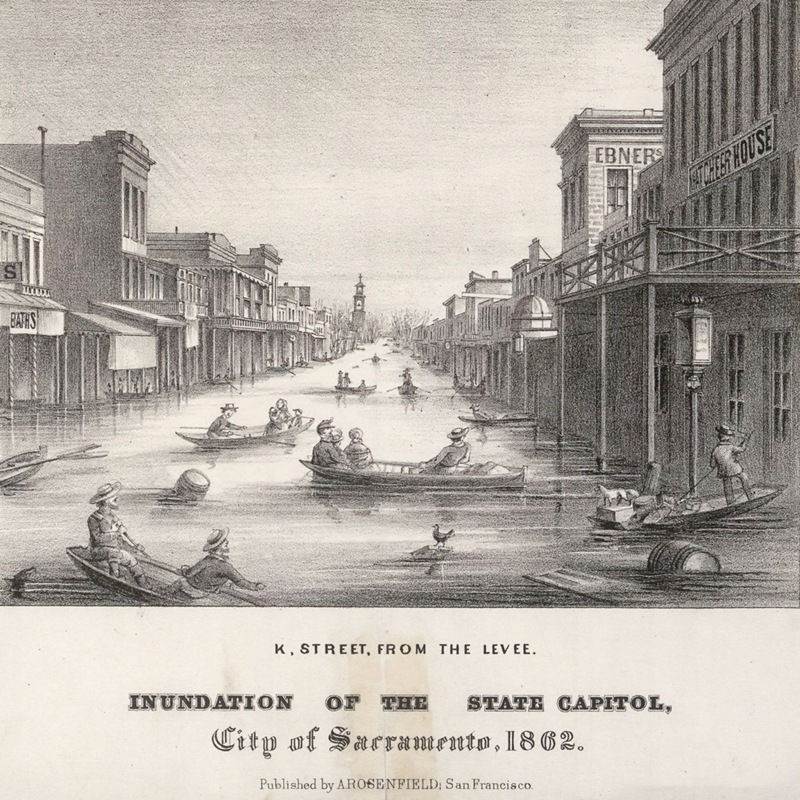 Atmospheric rivers are also essential sources of moisture for western reservoirs and mountain snowpack, but in 1861, a series of particularly intense and prolonged ones led to the worst disaster in state history: a flood that swamped the state. The megaflood turned the Central Valley into an inland sea and washed away an estimated one in eight homes. What would happen if the same weather pattern hit the state again? Los Angeles Times reporter Louis Sahagun explains in a new report that one dam in Los Angeles County is critically unready for such an event. If the dam fails, it could affect up to a million people in a dozen cities. And UCLA climate scientist Daniel Swain explains why disastrous flooding events like the one in 1861 are not only becoming more likely as the planet warms, but may have already been a more frequent occurrence than previously thought. Read Louis Sahagun’s reporting on California flooding and the Whittier Narrows Dam in the Los Angeles Times. Find out more about the ARkStorm scenario and California flooding in USGS’s official report. Dig into the changing math of flooding according to Daniel Swain’s study. Listen to Dr. Lucy Jones describe the events and aftermath of the 1861 California megaflood in a previous SciFri segment. Louis Sahagun is a reporter for the Los Angeles Times in Los Angeles, California. Daniel Swain is a climate scientist with joint appointments at the University of California – Los Angeles, National Center for Atmospheric Research, and the Nature Conservancy. He’s based in Boulder, Colorado. IRA FLATOW: This is Science Friday. I’m Ira Flatow. The headline in a recent LA Times was worrying at best. “Rare LA mega-storm could overwhelm dam and flood dozens of cities,” the article warned. That dam is the Whittier Narrows Dam, which overlooks the town of Pico Rivera, east of Los Angeles. And that mega-storm is a hypothetical 1,000-year flood, like the 45 day deluge that drowned the state in 1861– the worst disaster that many people have never heard of. A new analysis from the US Army Corps of Engineers found the Whittier Narrows Dam would be unable to handle the 36 inches of rain that fell in 1861. And its upgrade has been made the highest priority of any project in this country. A failure of the dam could affect up to 1 million people in the region. Here to explain more about– explain more about that is Louis Sahagun, a staff writer for the LA Times. He reported on the story. Welcome, Louis. LOUIS SAHAGUN: Thank you for having me. IRA FLATOW: You’re welcome. Now, your story starts with this new analysis from the Army Corps. What exactly are they concerned about in Los Angeles? LOUIS SAHAGUN: The situation at Whittier Narrows Dam actually underlines how climate change has suddenly become an urgent local safety issue in Southern California. The spillway and the earthen dam were built in 1957 by the Army Corps of Engineers to control flooding and store water along the San Gabriel and Rio Hondo Rivers. By the way, they’re about 13 miles south of downtown Los Angeles. Its construction was an urgent need at the time. And it displaced hundreds of people, including those in a farmworkers’ camp where my family lived at the time. And I’m actually old enough to remember the commotion caused by the federal government’s order for the Mexican-American families there to leave the area. Today, that dam poses a serious risk to more than a million people who live downstream and 25 mostly working-class cities. Most of the year, that 56 foot tall, 3 mile long dam contains little water. But the Corps recently classified it as the top safety issue in its system of 700 dams nationwide. That is the cause. Go ahead. IRA FLATOW: So they’re saying the dam needs to be upgraded ASAP. But they need money from Congress, right? Is the Corps assured of getting funding from Congress for this project? LOUIS SAHAGUN: My understanding is that it is. And it needs roughly, well, up to $600 million to make the needed repairs. That’s because its engineers recently found that the dam would fail if water were to flow over its crest or if seepage eroded the sandy soil underneath. Also, unusually heavy rains could trigger a premature opening of the spillway, releasing more than 20 times what the downstream channel could safely contain. Now, in the Army Corps’ worst case scenarios, which are derived from computer modeling, estimating the risk during a 900-year storm event, downstream cities such as Pico Rivera, which has a population of 63,000 people, would be hit with water 20 feet deep. And their current evacuation routes would be turned into rivers. IRA FLATOW: No, I’m saying, you have outlined the incredible risks. How soon could the renovation be made? What are we talking about here? LOUIS SAHAGUN: Yes, on Wednesday, Representative Grace Napolitano, whose district includes many of the downstream cities in question here, urged the Army Corps to make safety repairs at Whittier Narrows its highest budgetary priority. The Corps is expected to get the money it’s asking for, the $600 million, from Congress and complete the job by 2026. In the meantime, downstream communities are only just beginning to revise their evacuation plans– revise their evacuation plans. And researchers are suggesting, time is running out. IRA FLATOW: Well, I want to thank you very much for taking time to explain it to us, Louis. IRA FLATOW: Louis Sahagun is a staff writer for the LA Times in Los Angeles. I want to continue on to the bigger picture. These major flooding events are more likely to happen as the climate warms. But according to research from my next guest, they were also already more likely than we thought. And the problem isn’t just one for Los Angeles, but the entire state of California. Dr. Daniel Swain is a climate scientist with joint appointments at UCLA, the National Center for Atmospheric Research, and the Nature Conservancy. And he joins us from Boulder, Colorado. Welcome to Science Friday. DANIEL SWAIN: Thanks so much for having me. IRA FLATOW: We’ve been referring to this as the big flood of 1861 and ’62. How bad was it though? DANIEL SWAIN: Well, it was a big one. And as I think you alluded to in the introduction, it’s one of the greatest California disasters that most Californians have never heard of. And that’s partly because it happened when California was a relatively new state. The population of the region at the time that this occurred, last occurred in 1862, was about 400,000, compare that to 40 million today. So the state was a very different place. And yet, even then, this was a massively destructive event. And it wasn’t a single storm. It was actually a sequence of what are known as atmospheric river storms that lasted more than a month and brought wave, after wave, after wave of rain, pretty much to the whole West Coast of North America, but focused on California. And what it ended up doing was resulting in catastrophic inundation of almost all of what are now California’s most densely populated areas– the Los Angeles Basin, Orange County, the San Francisco Bay Area, and the Central Valley. The Central Valley, in particular, was very hard hit and essentially turned into an inland sea 200 miles long, 30 miles wide, and, in some cases, 20 feet deep. So this really was a fairly monumental event in California history. IRA FLATOW: And it’s been called the 1,000-year flood. But new research says it could happen more often than every 1,000 years? DANIEL SWAIN: Yeah, this was actually some of the motivation for the study we did last year. Where there had previously been this expectation that what happened in 1862 was, essentially, a vanishingly rare or unlikely freak event. But it turns out that work conducted in the 2000s, especially by UC Berkeley researchers, suggested that the flood deposits in some of California’s coastal river systems suggested that floods equal to or even greater than what happened in 1862 occurred multiple times per millennium, so really every 150 to 200 years. So rather than being 1,000 year flood, it was really somewhere more like a 150 or 200 year flood, meaning that it happens five times more frequently than we used to think. And so even if we don’t address the climate change question quite yet, these kinds of events are probably more common than we used to think they were. IRA FLATOW: And let’s talk about the causes of all this rain. You mentioned something called an atmospheric river. Tell us what that means, and how it forms, where it comes from, where it goes. DANIEL SWAIN: So an atmospheric river, it’s a very evocative term. But it actually evokes, essentially, the correct sense of what it is. It really is a river in the sky in a sense. It’s a river of concentrated atmospheric water vapor that looks– if you look down on it from space, looks like a sinuous meandering stream, much like you’d have with a stream on land. And this plume of moisture in the atmosphere can sometimes attach itself to a winter storm system. And when that happens, that storm system can squeeze out a very large fraction of that water vapor in the atmosphere as precipitation over land, particularly in California’s coastal mountains. And the amount of rain that can fall from these storms, these atmospheric river storms, is very much comparable to landfalling hurricanes on the East Coast or the Gulf Coast of the United States. So they can drop easily 10, 20, or even more inches of rain over the course of just a couple of days in the coastal mountains. So they can be massively productive and rainy systems that can produce very large flood events. In fact, the vast majority of major flood events, not just in California, but along the entire Pacific Coast of North America, are the results of atmospheric rivers. IRA FLATOW: So you have this river that– I’m picturing it, actually, in the story that you did. I’m thinking of a river that’s actually a certain number of miles wide, a certain number of miles deep. It stretches out into the Pacific, and then carries all this moisture, and just flows into California, and drops all that rain there. Would that be inaccurate? DANIEL SWAIN: That’s essentially correct. These atmospheric rivers are usually a couple hundred kilometers wide, but can be a couple thousand kilometers long. And they can carry in the air above your head as much as 20 times the water that’s in the Mississippi River at the mouth in the Gulf of Mexico. DANIEL SWAIN: It’s a phenomenal amount of water. And it’s all in the form of water vapor above your head. So it’s really kind of amazing to think about. IRA FLATOW: And is global warming going to exacerbate this? DANIEL SWAIN: All available evidence suggests that the answer is yes. And this is one of those cases where there’s actually pretty high confidence because model projections are consistent with observations, which is also consistent with pretty basic theory. And that basic theory is simple enough that I’ll just take a moment to explain it here. Essentially, as temperatures increase, the amount of water vapor that the atmosphere can hold increases exponentially. So even as temperature increases relatively slowly, the amount of potential water vapor in the atmosphere increases much faster than temperature. So as you evaporate more water, you allow for the ceiling or the upper limit on the amount of moisture in these atmospheric rivers to increase. And so you don’t necessarily increase the amount of precipitation all the time. But you definitely increase the maximum potential precipitation that can fall out of these sorts of systems. And they mention the “big one” is going to be an earthquake. But you don’t hear many people talking about the “big one” being a flood that could fill up the Central Valley. Are people beginning to talk about it? DANIEL SWAIN: Yeah, I think the comparison to the earthquake hazard in California is an apt one. And actually, the contingency planning exercise conducted by the US Geological Survey in the state of California a few years ago, actually referred to a repeat of an 1862-like flood in California as Californians quote, “other big one.” The original “big one” being a large magnitude earthquake. And the state assessment, essentially, found that a repeat of the 1862 flood could actually be, economically, and in terms of the statewide disruption, far worse than a large earthquake in Los Angeles or San Francisco and could cause upwards of 3/4 of a trillion dollars in damages. And that’s a pretty sobering statistic. And the other really sobering aspect of this is that a lot of these damages would occur in California’s most important economic regions– the Central Valley, where there’s so much agriculture; the San Francisco Bay Area, where Silicon Valley generates so much economic activity; and, of course, Los Angeles region, home to Hollywood and lots of other industry. All of these places are locations that would be very hard hit. So I think there is increasing interest and recognition in the hazards posed by a really big flood event. But I think, in certain circles, it’s still overshadowed by other risks. Everyone in California knows about earthquakes. And many people prepare seriously for them. Yeah, increasingly, people are really aware of the wildfire risk. And that’s an awareness, I think, that has grown due to some really tragic events in the last couple years. But we don’t have as much recent experience with these really large flood events. And I think that does mean that it’s a little bit more abstract for a lot of people than some of these other risks that we’re more familiar with. IRA FLATOW: I think what might make it abstract to people is that we just came out of a huge drought in California, right? And now, we’re talking about a huge flood in California. Is that the future? We go from one extreme to the other? DANIEL SWAIN: Yeah, it’s absolutely the case that California has recently had a lot of drought and a lot of wildfires. So scarcity of water has been more in the news than overabundance. But that is, in fact, what we expect California’s future to look like. Where even if we don’t see a tremendous change in the average annual precipitation in this part of the world, we do expect to see increasingly dramatic swings from one extreme to the other, from very wet to very dry conditions, and then back in the other direction. And that does present some real challenges because it suggests that, first of all, we can’t– we don’t want to focus too much just on that average precipitation metric because it’s not really telling us much about what’s happening a lot of the time, with the drought and flood risk. But it also means that managing water scarcity or managing flood risk becomes more challenging because we have to deal with ever greater extremes on opposite ends of the spectrum. And this is, essentially, the future that we expect to see in California– warmer almost all of the time, but both, simultaneously, wetter in some years, and drier in others. IRA FLATOW: And when you say challenging, that means the M word, money. Right? How do we prepare for these extremes? DANIEL SWAIN: It’s certainly an expensive challenge to address. But it is also, practically speaking, even to know, in the ideal world where money was no object, exactly what we would want to do because some folks say, well, of course, the obvious solution is to build more big dams to store more water in the wet years. But there’s a number of issues with that approach. One of which, I think, is highlighted by the risks we’re currently talking about in terms of the risk of catastrophic failure of some of these big important pieces of infrastructure, given a big enough storm. IRA FLATOW: All right. So we’ll have to leave it there. We’re out of time. Daniel Swain, Dr. Swain is a climate scientist with the Institute of Environment and Sustainability at UCLA. Thank you for taking time to be with us today.